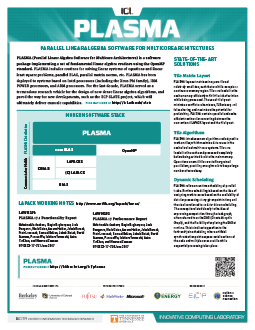 The Parallel Linear Algebra Software for Multicore Architectures (PLASMA) package implements a set of fundamental linear algebra routines using the Open Multi-Processing (OpenMP) standard. PLASMA includes, among others, routines for solving linear systems of equations, linear least square problems, parallel BLAS, and parallel matrix norms. 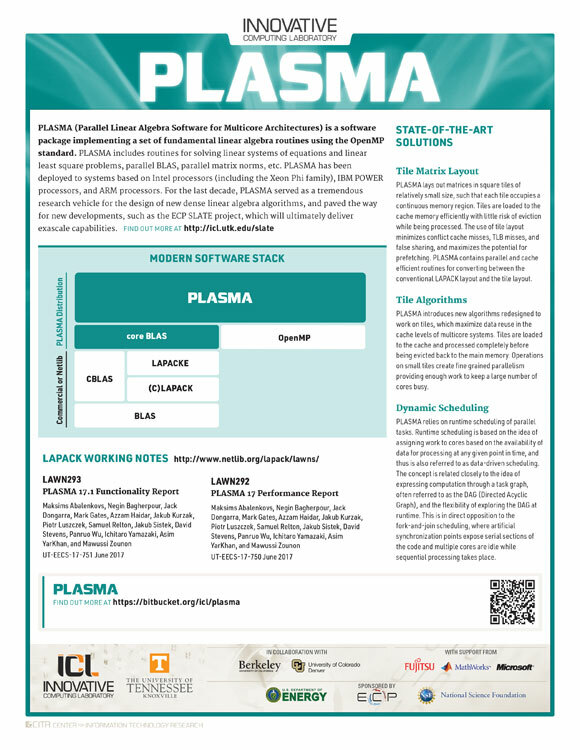 Over the last decade, PLASMA—which has been deployed on a variety of systems using Intel processors (including Xeon Phi coprocessors), IBM POWER processors, and ARM processors—has served as a tremendous research vehicle for the design of new dense linear algebra algorithms and has paved the way for new developments, including the new ECP SLATE project, which will ultimately deliver these capabilities at exascale.